Does the stress of your mounting debt keep you up at night? If you dread opening your monthly credit card statements, Money Girl's 10 Steps to a Debt Free Life is for you. Laura Adams, host of the top-rated Money Girl's Quick and Dirty Tips for a Richer Life podcast, takes you step-by-step through exactly what you need to do get out of debt and stay there. Laura's 10 steps will give you the guidance you need to deal with all kinds of debt, from credit card and medical bills, to mortgages and car loans. She'll help you assess your current financial situation and create a personalized plan you can live with. You'll learn which debts to pay off first and will get tips on negotiating with creditors and paying off bills faster. Laura's advice on boosting your credit score, cutting costs, and saving money will help you lay the groundwork for a debt-free, happier life. You'll be surprised at how easy it is to make simple changes that will have a big impact on your financial health. Laura Adams explains everything in the informative, practical voice that her legions of followers have come to appreciate in the Money Girl podcast. 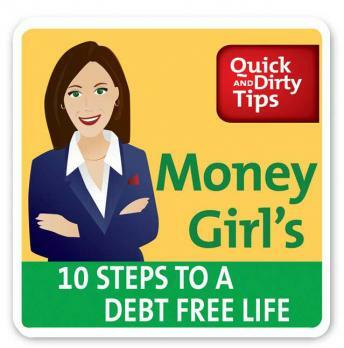 Her Money Girl's 10 Steps to a Debt Free Life will give you the knowledge you need to take control of your finances and create a more secure financial future. You will owe less, own more, and rest easier.